In the Americas, more than 34,000 women die each year from this disease, which can be prevented through vaccination, screening, and treatment of precancerous lesions. WASHINGTON - The Pan American Health Organization (PAHO) launched a communication campaign today to prevent cervical cancer, which kills more than 34,000 women each year in the Americas and is among the leading causes of cancer death in women in 23 countries of the Region. “It is Time to End Cervical Cancer” is a communication campaign designed to inform health providers and empower women and girls with health information on how to prevent this disease, which is diagnosed in some 72,000 women each year. 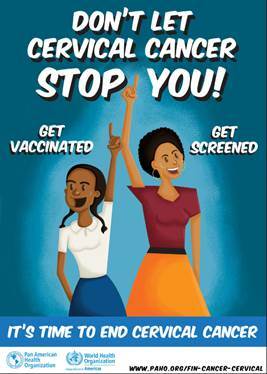 With the slogan, “Don’t let cervical cancer stop you,” the campaign provides materials (poster / video), information and stories about the vaccine against human papillomavirus (HPV), the cause of cervical cancer and about cervical cancer screening methods, to encourage women to have regular examinations for the early detection of precancerous lesions. The ultimate goal is to mobilize health providers, women and girls to seek preventive care and stop cervical cancer from keeping women from reaching their maximum potential in life. Cervical cancer can be prevented with HPV vaccination and with screening. The HPV vaccine is recommended for girls ages 9 to 14 and is available in 35 countries and territories of the Region. However, in the majority of countries, the HPV vaccine coverage rate with the recommended two doses, has not yet reached 80% of the target population. In September 2018, the Ministers of Health of the Americas, at the PAHO Directing Council meeting, agreed on a plan to reduce cervical cancer by a third in the Region by 2030. To accomplish this, the plan aims to strengthen primary prevention through information and education and HPV vaccination, as well as improve cervical cancer screening and treatment of precancerous lesions, and strengthen access to cancer diagnosis, treatment, rehabilitation, and palliative care. This online and social media campaign is an additional instrument in PAHO’s toolkit to help reach the goal of ending cervical cancer.